Secluded ridge cabins close to the Red River Gorge and the Natural Bridge. 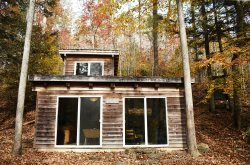 Chop Chestnut Cabins are a located up on a ridge surrounding by woods near to the Red River Gorge. These cabins offer a quiet retreat with views and wooded lots. Each cabin is uniquely designed featuring hot tubs and porches to enjoy the wooded area. A ten minute drive to the Red River Gorge makes it a great home base for a day hike through the forest or visit to the Natural Bridge area. Then return to grill out in the yard and relax in the hot tubs at these cozy cabins.